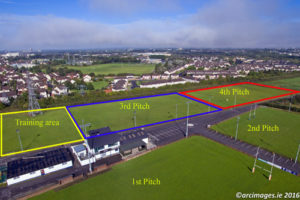 Old Crescent RFC crowned Champions of UBL Division 2B! Rosbrien was in festive mood as we played our final Ulster Bank League game of the season on Saturday, 14th April, and after one of the best seasons in the history of the Club, our 1st XV were officially crowned Champions of the Ulster Bank League Division 2B having gone through the season unbeaten (17 wins and 1 draw) and picking up 13 try bonus points along the way. Nicky Comyn, Vice President of the IRFU, and Ulster Bank’s Cian McInerney, were guests on the day to present the Cup and medals to our victorious team. The game itself was no stroll in the park despite there being nothing critical at stake for either team. 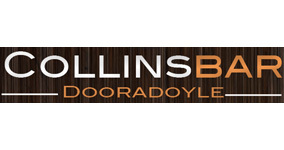 Tries by Kevin Doyle, Val McDermott, Brendan Guilfoyle and Geoffry Coyne, all converted by Ronan McKenna, were enough in the end to see off Rainey who now have the playoffs to look forward to. 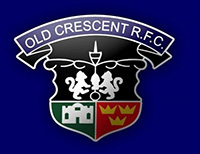 Final score Old Crescent RFC 28 Rainey Old Boys 8. 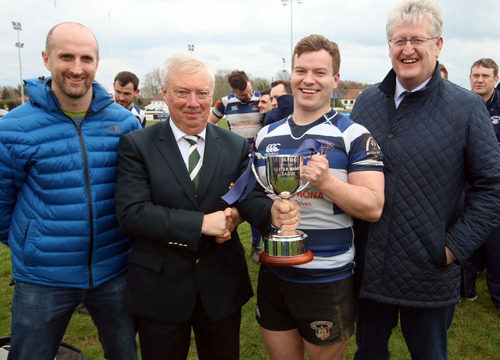 Our picture shows Nicky Comyn, IRFU Vice President, presenting the UBL Division 2B Trophy to Darragh O’Brien, Club Captain, Old Crescent RFC, watched by Cian McInerney, Ulster Bank, and Tim Duggan, President, Old Crescent RFC. Photo Brendan Gleeson.